Let us be your florist. From birthdays and anniversaries to holidays and weddings, our staff has over 40 years of combined experience and strives to make your every request come true. 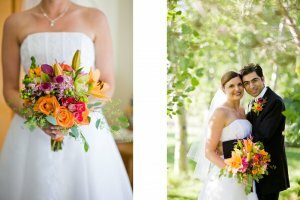 We specialize in hand-tied bouquets, garlands, arbor rentals, and centerpieces to fit every bride's budget. Call us to book your wedding flowers today! Rt. 2 west from Bethel. Left on the Bog Rd.